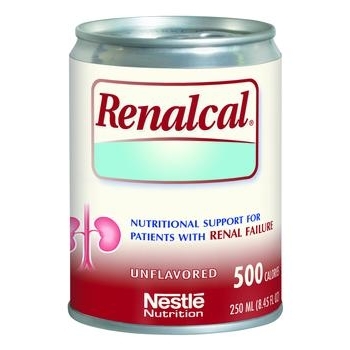 Nestle Renalcal® is a ready-to-use formula designed for the nutritional support of patients with renal failure. It is calorically dense, low in protein and contains negligible electrolytes. Nestle Renalcal® is a ready-to-use formula designed for the nutritional support of patients with renal failure. It is calorically dense, low in protein and contains negligible electrolytes. Renalcal features a patented blend of L-amino acids to support positive nitrogen balance and help manage uremic symptoms.